Limited Edition: 350 copies Worldwide. 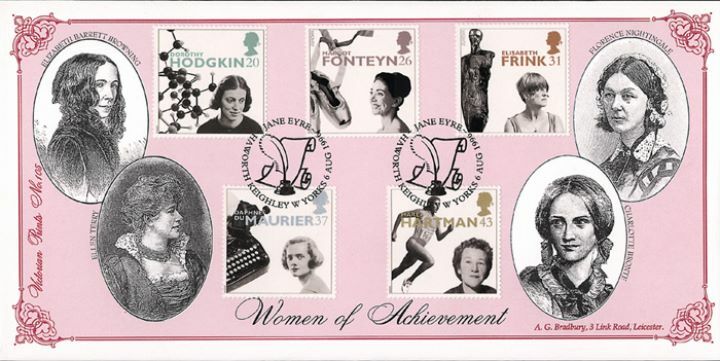 The above Royal Mail Women of Achievement stamps were issued on 06 August 1996 by Royal Mail and feature the following stamp designs: 20p Dorothy Hodgkin - scientist; 26p Margot Fonteyn - ballerina; 31p Elisabeth Frink - sculptress; 37p Daphne du Maurier - novelist; 43p Marea Hartman - sports organiser. The Victorian Women first day cover with the Haworth Special Handstamp postmark has been produced by Bradbury and features these stamps which can make a very collectible and lovely gift.